Finally decided the fam is ready for a pup? It's a big decision, but one that will ultimately benefit everyone, especially the little ones who were (not-so-subtly) hinting for that cuddly labradoodle. Whether they join on walks, feed the furry, or even scoop the poop, your kiddos are about to learn the importance of care-giving. Not only does it build confidence, it helps raise good humans. The crew may be begging for a puppy, but you know your dynamic best. Be honest with yourself, what can your family handle? Not quite ready for that 3-month-old lab? That’s okay! Puppies are hard work. Consider rescuing an older dog. Older dogs can be easier to manage and probably have outgrown that destructive chewing stage that puppies are notorious for (hide your shoes!). Or look into breeds that are a bit lower-maintenance and known to be kid-friendly. Knowing your family’s limitations is super crucial to a successful pet experience. 2. The importance of space. Boy, puppies are especially cute. Adults can barely contain themselves when presented with an adorable, fuzzy puppy. Can you blame a little kid for wanting to nuzzle it or wheel it around in a toy stroller? That's why it’s key to always supervise the first encounters and constantly remind your children to be gentle and respectful of your pet’s space. Many people crate train and reinforce crates as safe spaces for your pup. 3. Hands-on care by the kiddos is a MAJOR plus. Getting your brood involved in everyday care results in meaningful pup bonding. Socialize early, often, gently and positively. 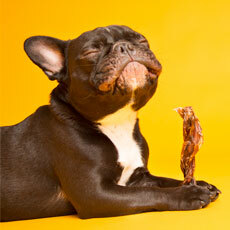 Rewarding good behavior with treats and engaging in quality play time is the best way to bond. That’s where BarkBox, a monthly subscription service, comes in. It’s one of our faves, and the fun-factor of a themed delivery of toys and treats keeps everyone on their toes. How can you NOT smile at a Chewrassic BarkBox on your doorstep? P.S. : BarkBox has special toys for the especially chompy ones. It's a personal preference, but do your research. Some people prefer to adopt dogs from shelters while others want a specific breed to avoid shedding or allergies. 5. Get ready to make memories. Adding a furry member to the fam will always come with tons of joy. And maybe some messes. But hey, so do kids! Bonus: your Instagram feed will get approximately 20% cuter. Embrace the crazy, the cuddles and most of all, enjoy! 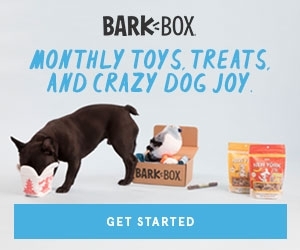 Spoil your dog with BarkBox—a monthly themed delivery of 2 mind-blowing toys, tailored to your dog’s size, 2 full bags of drool-worthy treats, and an all-natural chew.